Private holiday house Villa Karavousi in Kazaviti on Thassos island Greece for rent. For a correct display of this page java script is required. Holiday House Villa Karavousi on Thassos island in Greece, for 2 - 6 persons. A traditional Macedonian house, an imposing landmark building, erected at the upper periphery of the village more than a century ago. Solid walls of stone and clay with a roof construction of white-washed, openly visible beams, the roof covered by stone slate. Large lofty balcony – fully roofed and further sheltered by a side wall and a stone/clay half-wall in front, with a marvelous panorama view down the valley towards the sea and the mountains beyond, in a westerly direction (sunset). Below, on the ground floor level, but elevated above the land in front, a well sheltered veranda, again with a wide view towards west. Further seating areas in the sideward's and backwards gardens on three terraces of land with lush greenery, vine pergolas and fruit trees. On the ground floor the dining / seating room with direct access to the large kitchen and to the veranda in front. Heating facility for the cooler seasons (oven for burning wood). Also on the ground floor the spacy, marble-fitted bathroom (with shower and small washing machine). A second door leads directly from the kitchen to the stone paved area in front of the house. On the upper floor level two bedrooms with access by internal wooden and by external stone stairs. A wooden door connects these rooms. Both of them have direct access to the balcony in front. All the traditional fittings and the historic character of the house have been carefully preserved. Very quiet location. Direct access to the natural landscape above the house. No car traffic can reach this place. Walking distance from the village square app. 5 minutes. 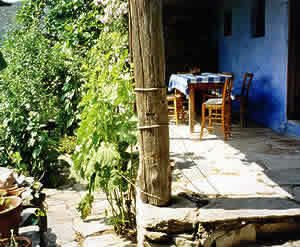 The mountain village of Kazaviti on Thassos island is situated 4 kilometres inland at the end of a wide green valley. The access road branches off the island’s ring road within the settlement of Prinos, at a sharp bend to the right: there the road to Kazaviti continued straight on, passes several shops and then gently ascends the valley. Past the settlement of Mikro Chorio until reaching the steep drive way into the village of Kazaviti (=Ano or Megalo Prinos), just before the end of the asphalt road. From the port of Kavala on the mainland there are regular car ferry connections to Skala Prinou on Thassos island. The crossing takes app. 1 ½ hours. The distance from Skala Prinou to Kazaviti via Prinos is 7 kilometres. From Kavala there is also a hydrofoil (“dolphin”) service to Skala Prinou (only passengers, no cars). Crossing time 30 minutes. A further car ferry service operates between the mainland port of Keramoti and Limenas on Thassos. Keramoti is the nearest sea port from Kavala airport. Crossing time 30 minutes. Driving distance on Thassos from Limenas to Kazaviti is 23 kilometres. Here you find the seasonally changing ferry boat time tables. Charter flights from the UK to Kavala airport operate frequently all over the tourist season. It might be cheaper, though, to book a flight to Thessaloniki and drive to Kavala by rented car, app. 1 ½ hours, or by bus (departure every full hour, 11 € one way, app 2 ½ hours). Here you find the airline links. Special car rental conditions for booked guests of our holiday houses are available at Potos Rent a Car. Car pick up at Thessaloniki or Kavala airports.